Do you have have an old Mega Drive cart or box lying around that you never even look at? Well now you can do something with it! If you’re good at arts and crafts you can make your own Mega Drive and Genesis boxes for the upcoming retro inspired, game Sonic the Hedgehog 4. You can download all of the files you need to make it here! So there’s something neat for you to do on this boring Sunday. Now all you have to do is send it to me once you’re done because I’m useless at crafty things. Have fun! Angry Game Kid reviews Sonic 4! This is so creative! Now I wish that I kept my SEGA Genesis. Can I connect the S4 cart to the S&K one? I hope Sega sees this and makes an official version of it to sell. That is really awesome. Too bad it wouldn’t be in Sega’s best interest to actually create a version of Sonic 4 that would work on the Genesis. 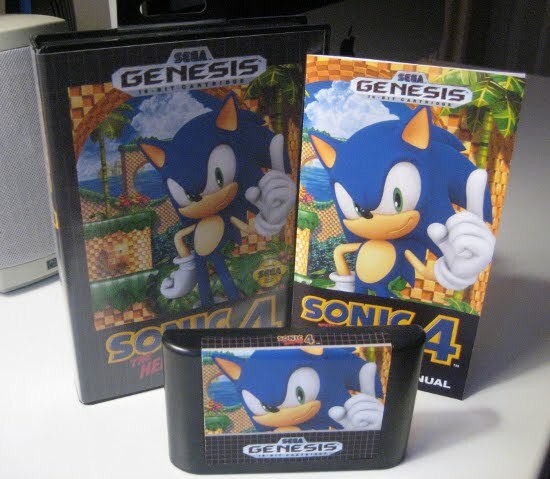 Come oooooooooooon fan made Sonic 4 for Genesis. Just awesome. Now, all we need to do is have SEGA release Sonic 4 on SOME sort of physical media so we could actually justify having a case for it. I know there was talk of it down the line, after they release all the “episodes”, but I don’t think anything has been confirmed, has it?